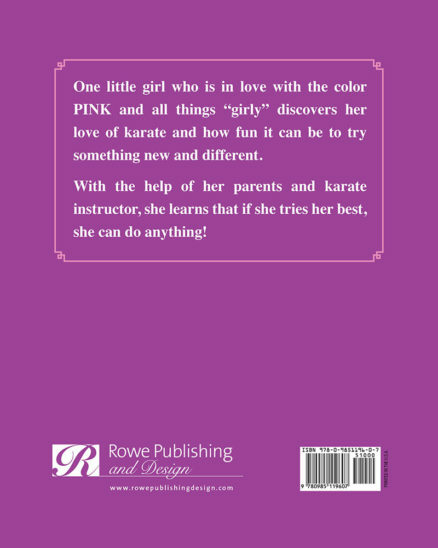 One little girl who is in love with the color PINK and all things “girly” discovers her love of karate and how fun it can be to try something new and different. With the help of her parents and karate instructor, she learns that if she tries her best, she can do anything! This whimsically illustrated book was created to inspire young girls to create new goals for themselves and to understand that they are capable of trying and excelling at anything that boys can do. With determination and encouragement, a child can do anything they set their mind to while laying the foundation for a successful future. As a mother of two, Mrs. Sweenie has seen her daughters gain confidence, respect and discipline through their study of karate. Karate is just one example of how children can strive for excellence in everything they do. Cute Book; Positive Message. Girls Don’t Take Karate is a cute picture book by Susan Sweenie which will appeal to many young girls. In a fun way, Sweenie also teaches an important lesson that every girl should know. In contrast to its title, her picture book encourages girls to believe: You can do anything! Chloe is a character a lot of young girls will relate to. For one thing, Chloe adores dressing up and wearing fancy clothes. One doesn’t need to look further than the multitude of princess outfits or fashion magazines to realize how many girls (even big ones) harbor Cinderella dreams of going to extravagant parties. For another thing, Chloe looks forward to playing with dolls. While lines of certain dolls are being retired due to low sales, the fact that other lines are being revamped or expanded show that dolls remain popular toys. Third, Chloe loves the color pink. My mother-in-law and I recently attended a musical based on a picture book called Pinkalicious. That there is a book bearing that name, and that it inspired a theatrical production, are in themselves revealing statistics. Combine this information with the sea of girls in pink who attended Pinkalicious and I have no doubts about how popular the color is with the younger female population. In all the aforementioned ways then, Chloe is a highly relatable character. Too bad I couldn’t relate as well to her sudden passion for karate. The karate part of the story starts out cute enough, with Chloe asking if she can earn a pink belt. 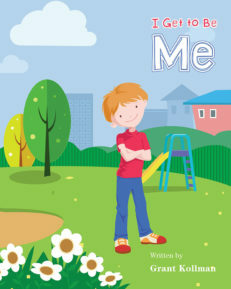 After that, however, author Susan Sweenie relies on summaries of what the teacher instructs, the skills Chloe learns, and her performance on the “final exam” to carry forward the story. There are many activities over which my students express nervousness the first time they attempt them, but Sweenie only tells us that Chloe liked that her teacher taught her the same values as her parents: focus, listen, and show respect. Alternatively, my siblings rarely tried anything without the other or without a friend, but Chloe apparently does not make any friends at her karate class. By neglecting to give me insights into why Chloe found karate exciting, Sweenie missed her chance to encourage readers to themselves to try karate or any other new endeavors. There’s a final way in which a lot of girls (and boys) will relate to Chloe, which is in their desire to do the same thing, over and over, day after day. Chloe’s mom finally decides to intervene and require Chloe to try something new and so signed Chloe up for karate. Naturally, just as Pinkalicious felt upset with her parents when they ordered her to eat green food, Chloe gets mad at her mom for what she perceives as interference. With Pinkalicious, it was only when she turned red (alas, not pink) from eating so many pink sweets that she softened her stance. That extreme isn’t going to happen in the real world. Bribes might, however; which is how Chloe’s mom finally convinces Chloe to give karate a chance. Kids and parents will relate! Yes, Chloe represents a stereotype. That’s okay though because many girls really do embrace these feminine qualities. Case in point, the author of Pinkalicious was inspired by her two young daughters and their love of everything pink. It’s also okay because of the point that Susan Sweenie wishes to make with her picture book: One might love “girly” stuff, but that doesn’t mean one should limit themselves. Girls CAN and SHOULD try all kinds of activities–maybe even karate. A great life lesson for kids! This book was really cute. All about a little girl who loves pink. She loves pink so much, more than anything else. Then she is introduced to Karate. She is scared to go and doesn’t think she will like it, because it’s not the girl thing to do. But eventually ends up loving it. This book has a great message for kids: try it out before you say you don’t like it. See if you might like it before saying no. It’s done perfectly from a child’s point of view. I read this book to my 6 year old, who happens to be a boy who takes karate. He loved that it involved karate and he really did understand the point of the book, which was nice. A great book that teaches kids they can step outside the box and encourages them to try new things and not be scared because they may actually like it! I’m excited to have my 6 year old niece read this book. I think she’s really going to love it! Adorable story with a lesson. Chloe is a really girly girl. Everything she owns and wears is pink, and she won’t hear anything about wearing other colors. She loves being a girl so much, she is upset when her mom signs her up for karate classes–because girls don’t take karate! What I particularly loved about this book is that it teaches kids an important life lesson in a way they can understand. 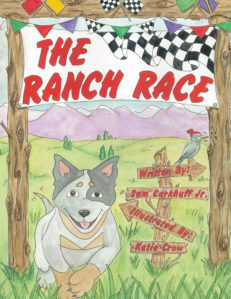 The author did a really great job of portraying events from a child’s point of view. Such a cute book, with a really important lesson. It teaches kids that they shouldn’t be scared to try something new…you may be happy with the things you’re comfortable with, but you may love something new even more! Great read! Loved this book! Read it to my daughters who thoroughly enjoyed it. The book is creative and enticing, while still delivering an important message…. which not many childhood books do these days. The message conveyed is to encourage children to try to new things. Illustrations were great as well, very captivating and facilitated smooth flow of the book. Overall…FIVE STARS!!! 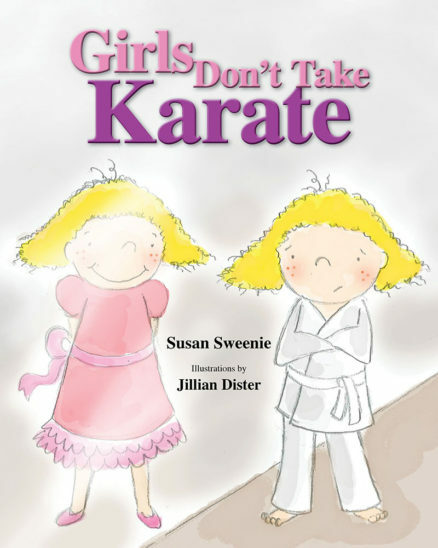 A fun picture book about a little girl who takes Karate lessons and earns a Yellow Karate belt. Chloe started out doing it for a pink dress turns into something else. 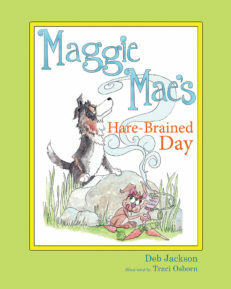 Cute Story – This book is about a little girl that doesn’t want to try new things. Through the story she learns that trying new things is fun. I thought it was the cutest story. It helps kids to see that new things are not a bad thing. The illustrations are adorable and fit the story perfectly. Adorable read! I bought this book to read to my 3 young girls and they loved it. The pictures are so cute and colorful and the story held their attention. This is definitely a book we can read over and over again. My son also enjoyed the story, as he takes Karate. Overall, highly recommended. Looking forward to more books from this author!